Established in 1895, 9-hole Reigate Heath Golf Club was described by Peter Alliss as “a little gem” when he featured the course for his 80s BBC TV show ‘Around with Alliss'. Full of charm and bursting with character, the course is set within a 120-acre Site of Special Scientific Interest, where heather and gorse-lined fairways are laid out on a natural heathland landscape around a beautiful old clubhouse and windmill. The course is configured with nine holes and eighteen separate tees which are positioned so that they change the appearance of every hole to a greater or lesser extent. Sometimes the tee placements are shorter or longer on the back nine, other times they’re located on the other side of the fairway, offering a different angle of play. There’s only one par five on the card (at the 484-yard 4th) because it’s played as a long par four at the 13th hole on the back nine, where it also attains the stroke index 1 rating. The fairway narrows considerably as it approaches the point where it doglegs sharply left towards the green so a par score on either hole will be well earned. I joined Reigate Heath in Feb 2018 and have been so impressed with the course even in the dark, cold and wet winter days the course still played really well. When the sudden summer snuck up on us this year the course started to play amazingly well. The greens are some of the truest iv played EVER and the surrounding heather and stunning views make this place so special. I would recommend a visit to anyone!! Reigate Heath is right up my alley and I’d happily be a member here if I lived locally. I have an affinity with 9-hole courses (I’m a member of a 9-holer in Devon). In this busy modern world it’s much easier to find a couple of spare hours than it is to earmark half a day for golf. In my opinion Reigate Heath is probably the best 9-hole course in England. The first five holes are from the top drawer – the long par three 6th is not quite as stellar, but I’d love to own the delightful lodge house behind the green. #7 and #8 are two solid short par fours and the 9th is perhaps the prettiest one shotter I’ve played in a long time, where the windmill and clubhouse provide the loveliest backdrop. Mildenhall (a course I know well and appreciate) would not be so highly regarded by the cognoscenti if not for its engaging green complexes. Reigate Heath does not have the same St Andrews-esque greensite subtlety as its Suffolk cousin, but it does share a simple, unfussy and less-is-more essence. Reigate Heath boasts genuinely stirring topography – there’s ground movement here creating real golfing excitement – and the surrounding bucolic landscape is drop dead gorgeous. The heath is a designated site of Special Scientific Interest (SSSI) due to its wildlife and acid grassland. And how many courses can boast Bronze Age burial mounds? It’s where many non-golfers walk with their kids and dogs and I’d happily join them without my golf clubs in tow. Probably the most enjoyable two hours I’ve ever spent on a golf course and the putt dropping on #9 to halve the match was entirely equitable. I don’t think I’ve ever been handed two cards in the pro shop before playing a course: one to mark my score and one explaining “course etiquette and health & safety”. Because the property is widely traversed by the general public – mainly locals out walking their dog – players have to be aware of several popular routes that are used by these non-golfers to cross the fairways, hence the additional card for reference. The clubhouse and adjacent windmill sit at the most elevated point in the middle of the property (they’re set at an elevation quite a bit higher than the surrounding landscape), overlooking the nine fairways that are laid out on the heathland terrain below. There’s a very comfortable, lived-in feel to the clubhouse and this ties in very well with the course’s slightly less than perfectly manicured appearance. I loved the way the tee boxes have been arranged to allow the same nine holes to be played twice from a variety of different yardages, vantage points and angles, with offset tee positions resulting in many of the more interesting tee shot visual images. Being critical, the only disjointed aspect to the routing was the long walk down from the green on the par four 5th/14th to the tee on the par three 6th/15th. Best holes for me were the downhill par four 2nd (where a ridge of gorse cuts diagonally across the fairway a hundred yards short of the green), the uphill par three 3rd (with a long carry across heather to a green that falls off sharply on the left), the tough par four 5th (played to a tricky two-tiered green), and the fabulous little par four 7th, which is heavily sand-protected around the putting surface. It’s around forty quid for an 18-hole round here, representing fantastic value at a charming little track where the SSS is one more than the par of 67 from the back tees. Just don’t get me started on comparisons with other 9-hole layouts (such as that famous 9-hole course in Suffolk which is much loved down the years by a golfing intelligentsia that obviously understands its intricacies and subtleties better than me) because Reigate Heath is superior to most of the others that I've played so far. As a member for over 20 years I feel your pain at the link between the 5th and 6th holes. There was originally a shorter route from just short of the green giving a direct route to the next tee. However the local council who maintain the heath found that the path passed over an ancient tomb and asked the club to re-route the path to the next tee. Glad you liked the course and the changes delivered by the 2 sets of tees on each whole. Next time you are in the area I'd love to host a game. They say that nice things come in small packages and that is exactly what Reigate Heath is and does. It’s a dramatically stunning nine-hole golf course located just outside the M25 on excellent golfing terrain which I can only describe as a heathery heaven. Perhaps it is apt that the grade II listed post mill situated adjacent to the clubhouse has been restored and is now used as a chapel! Despite its par of just 67 and yardage of 5,664 there is a real sense of grandeur about the course, especially during the opening holes, on what is a wonderfully scenic part of the property. The clubhouse is located at the highest point with the course plunging immediately downhill before wending its way round and back up in a clockwise direction. The routing is akin to another charming nine-hole course, Charnwood Forest in Leicestershire, and whilst the quality is much higher at Reigate both have similarly engaging personalities as they lead us gently round the estate. There are a number of standout holes at Reigate Heath. The first/10th is a fabulous starter as it bends around a bank of heather before you play up to a proud green worked into the hillside. The third/12th is a par three that has a magnificent green complex with the left-side blurring beautifully into the approach and at the same time tantalisingly falling away. Meanwhile, the fourth/13th has a majestic drive with the hole mysteriously sweeping away from sight in the distance. Often touted as the best nine-hole course in the UK I’m afraid I must give that accolade to Royal Worlington & Newmarket in Suffolk, which has a far greater complexity, but Reigate Heath is none-the-less exceptionally good, infinitely beautiful and just a lovely place to spend time on a golf course. Having drifted away from golf for various reasons I am now back full of energy and loving the game. Why? Simple. Joining Reigate Heath G CAn amazing experience and having played golf for over 40 years RHGC gives you the ultimate golfing experience of combining the modern with the original. It's a pretty , challenging course with plenty to offer. Each hole has amazing character and will give you a thrill every time you venture out onto the heath. The clubhouse is second to none in terms of character and is beautifully appointed. Add in the great and friendly team that run the club and you have a recipe for total golfing heaven. Don't miss the chance to play Reigate Heath Golf Club when you are next looking for a game in Surrey. Royal Worlington & Newmarket is supposed to be the best 9 hole course in the UK, but having played there recently I'd have to disagree. There is something very special about Reigate Heath. I think only Isle of Purbeck matches it for views and it is only by virtue of its limited holes that it is not 20 places higher in Surrey and vying for a top 100 spot in England. The course is not overly long but is a great example that you can defend a course in other ways, be it dog legs, heather, deep bunkering or contours and undulation. There is a reason Peter Allis and Bill Longmuir are members, it is a gem of a track! I am not too sure how many 9-hole courses are on the Top 100 website but I would imagine not that many. I was slightly reluctant to accept a recent invitation to play at Reigate Heath for no other reason than, ‘just 9 holes’. My reluctance was all wrong as this is a wonderful course in a beautiful setting – in fact after playing nine, I demanded that we went round again. Golf has been played on this heathland course for well over 110 years and I imagine that most players would have had a great time; the nice thing about the ‘back-9’ is that you do play from different tees, which makes holes longer or shorter plus there are quite a few different angles off of the tees too. I liked the 4th hole; a dog-legging par-5 and at 484 yards it is not too tricky but when it becomes the 13th, it is a 447 yard par-4 and unbelievably tough. The last hole is a par-3 and a picture to look at with the clubhouse and windmill to the rear – as the 9th it plays 136 yards and as the 18th, you can add 20 yards to the length which is enough difference to make you think that they are two separate holes. Nice feel around the clubhouse and the views over the course from the terrace need to be taken in during your visit…As I have already said this a beautiful land, common land in fact so do watch out for those walkers and black labradors!. If you get an invite to Reigate Heath, take it and don’t be a ‘9-hole’ course snob like I was. I joined RHGC about 18 months ago and must say I haven’t regretted it one bit. The course is short on the card but with four of the six par 3’s measuring over 180 yards it plays anything but short. Indeed the 12th is a monstrous 220 yards uphill to a devilishly undulating green – good whack for even the best golfers (just ask Ronan Rafferty). The views all around the course and from the recently re-furbished clubhouse are breathtaking (the course is situated on a site of special scientific interest). Yes it is a nine hole course but the varying tees on each nine make each hole a different challenge – many of the guests I have taken to the club turn their noses up at the thought of a nine hole course, but when they arrive and see the challenge that awaits them they change their mind pretty quickly and by the end are asking when they can come back again. 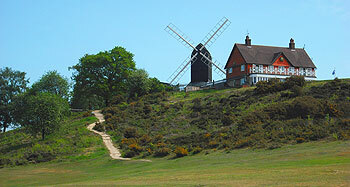 Walton Heath it is isnt but a more charming, challenging test of golf I cant imagine – plus how many courses in the UK can boast their own windmill!